I looked hard at the Omega before I got the Encore. I haven't shot the Omega but T/C makes good stuff. My Encore .50 ML can do 1.5" at 100 yards and I've managed a 0.25" group with my .223 barrel. My son is shooting an Omega and it shoots well. he shoots dead on at a 100 yrds and is in a 2" group at 200 yards. He has pushed it back to 225 and hits 4 out of 5 in a 3" circle. that is what i had decided to buy, until he called this morning with a good price on this Tradition Pursuit LT. he wants me to try one and see if it does as well as his gun. Just hate to get another gun with another type of problem, when I know his gun does well. Wait a bit to see if anyone has experience with the Traditions but I'd be leaning toward the Omega. 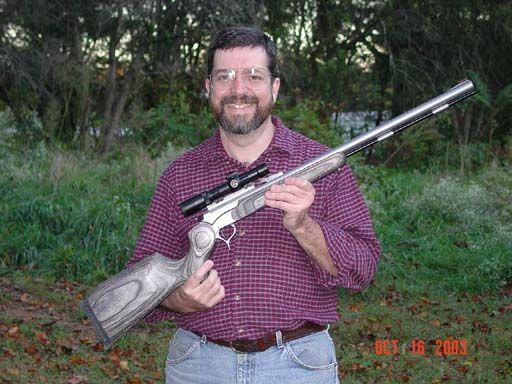 I do have a Traditions "Pennsylvania" rifle and it is the worst kickin' gun I've ever shot! Its due to the stock design though. Those old style guns with a ton of drop in the stock just don't feel good in .50 caliber. I have the Pursuit Pro and love it it's a older one with the standard 209 breech plug the newer ones come out with one turn. I have bin shootin mine for a few years with no complaints easy to load, easy to install and remove primers and pretty accurate. That pic looks almost exactly like the gun I was looking at. Does it have a lot of kick? Someone stated that their older style gun kicked hard. Not bad at all I'm shooting 110 grains of triple 7. It has a decent factory recoil pad. The old side locks are a lot of fun to shoot, I've shot more deer with my side locks then my inline. I did find out that you don't try to bench a .50 cal Hawken the same way you would a regular rifle. It will break your cheek and make it turn pretty green, yellow, and purple, not to mention it will bring tears to your eyes. Here's my Encore. It came this way new (w/o the scope of course) and I've never seen another like it. I do know that Boyds makes the laminated stocks for them. I've since replaced the recoil pad with one from Limbsaver, which makes a BIG difference, and changed scopes. What's your Encore weigh wearin' the laminated stock and .50 cal ML barrel? With the current scope (Bushnell Elite 3200, 1.5 to 4.5X) it weighs right at 9 pounds empty. I've also got a .223 barrel for it, with which I shot my best group to date, 0.25" at 100 yards. 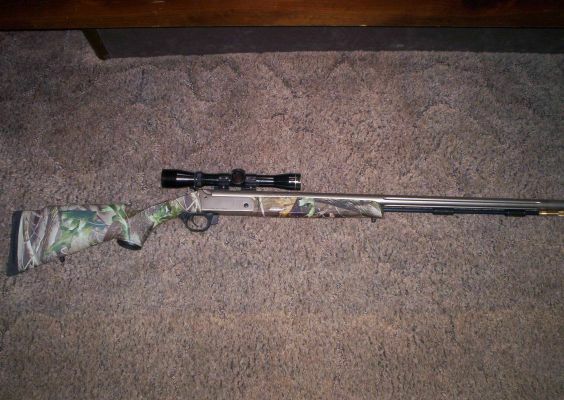 Sometime in the future I'd like to get something like a .300 H&H barrel for it.
. I did find out that you don't try to bench a .50 cal Hawken the same way you would a regular rifle. It will break your cheek and make it turn pretty green, yellow, and purple, not to mention it will bring tears to your eyes.